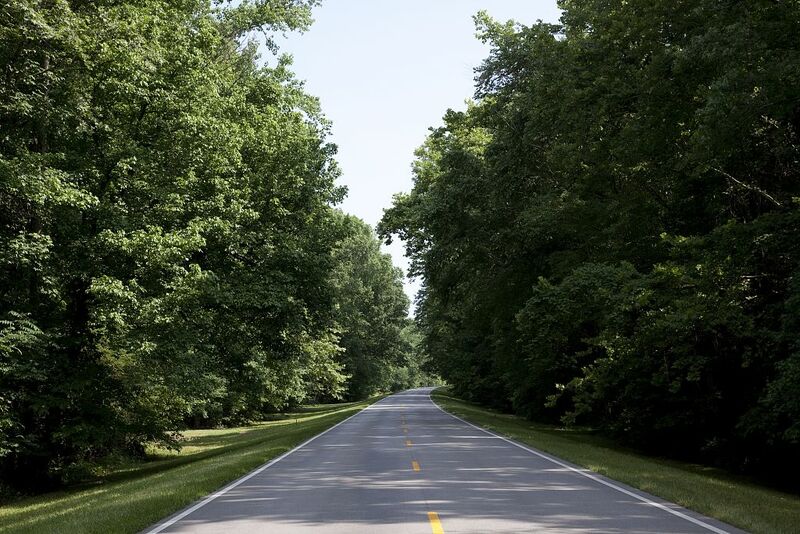 The Natchez Trace Parkway, one of nine parkways under the jurisdiction of the US Department of the Interior’s National Park Service, was authorized on 18 May 1938 to commemorate the Natchez Trace. Also known as the Old Trace, the path was a series of foot trails used by prehistoric Native Americans that became the primary route between the East and the Old Southwest during the late eighteenth and early nineteenth centuries. At 444 miles long and an average of 800 feet wide, the meandering two-lane twentieth-century road starts just southwest of Nashville, Tennessee, and heads diagonally southwest across Tennessee, through thirty miles of northwestern Alabama, and from the northeast corner of Mississippi to Natchez. The route roughly follows the historic Old Trace. About 97 miles of Old Trace are contained and preserved in the parkway’s right-of-way. Only about 60 percent of the Old Trace was still in use by the mid-1930s when a confluence of events set the stage for the commemorative parkway: a federal Depression Era public policy aimed at providing employment, a new class of roads to serve automobile-oriented recreation, and a revered but antiquated thoroughfare ideally suited to modern historic preservation and cultural marketing. The earliest commemoration of the Old Trace came with the Mississippi State Society of the Daughters of the American Revolution, established 1896 in Natchez. The project, to identify the Old Trace with granite markers placed in each county through which the path passed, was introduced at the Daughters’ first statewide conference in 1905. The first marker was installed in 1908 in Tishomingo County, with a Natchez marker following in 1909, and a marker at the Alabama-Mississippi state line in 1913. Seventeen stone boulders were erected by 1933 in Mississippi and Tennessee. There is some evidence that the Natchez Chamber of Commerce may also have initiated a movement to “pave the Trace” in 1915, and a convention met in Kosciusko to formalize the idea, but only limited documentation of the effort survives. The first incarnation of the Natchez Trace Military Association may have occurred at this time. The marking project undertaken by the Daughters of the American Revolution was winding down in the early 1930s, just as the Military Association was germinating, and the roles and relationship of the two organizations are unclear. Commemoration of the Old Trace in a new parkway was more than romantic nationalism: it provided economic vitalization through cultural marketing in the antebellum city of Natchez and much-needed transportation infrastructure for Mississippi. By most accounts, the Natchez Trace Military Association officially formed on 21 January 1934 in Jackson as a self-described “civic and patriotic organization trying to induce the Federal Government to pave the ancient Trace and preserve it as a National Parkway.” Within a few months the group officially dropped Military from its name as the project was to be headed by the US Department of the Interior rather than the War Department. Each county through which the Old Trace ran established an association chapter. A primary figure in this endeavor was Mary Roane Fleming Byrnes, who joined the Natchez Trace Association as corresponding secretary of the Adams County chapter. She quickly rose to become vice president of the state organization in 1934 and president in March 1935. She remained in the post for the next thirty-five years. Byrnes was born into an old Natchez family and resided at Ravennaside, where evidence of her passion was displayed in two rooms until the late 1990s. “The War Room” contained a site plan of the parkway, and the “Trace Room” was dominated by an oversized, hand-painted mural of the Old Trace. In 1934 federal legislation authorized fifty thousand dollars for a study of the Natchez Trace “with a view to constructing a national road on this route to be known as the Natchez Trace Parkway.” Mississippi congressman Jeff Busby had introduced two bills that year: the first, for the Natchez Trace survey, passed with a little help. Sen. Pat Harrison, chair of the Senate Finance Committee, and other members of the Mississippi delegation paid a convincing visit to Pres. Franklin Roosevelt, who signed the legislation. Busby’s second bill, which would have provided twenty-five million dollars in construction funds, failed, but the success of the survey legislation offered reason to celebrate. Adams County hosted a grand rally in July 1934 “for the purpose of enlisting interest in and support for paving the Natchez Trace,” which was envisioned, too optimistically, as “the first link of the proposed great international highway of strategic value connecting South and Central America with this country, and following the direct route of historic interest from the southwest to Washington and the east.” With funding from the Emergency Relief Appropriation Act of 1935, construction began two years later. That fall, groundbreakings were held for three discontiguous sections of Mississippi parkway, even before the land was designated a unit of the National Park Service. Parkway construction continued apace between 1937 and 1941, paused during World War II, and then resumed through the late 1960s. By this time, however, people and priorities were changing. The parkway concept was threatened after funding shifted to pay for the war in Vietnam and the Bureau of Public Roads grew into the interstate-building Federal Highway Administration. Locally, longtime superintendent Malcolm Gardner, at the park since 1936, retired in 1967. And after more than three decades at the Natchez Trace Association’s helm, the forceful Byrnes resigned just before her death in 1970. During the effort to complete the Trace over the following decade, the association relocated from Natchez to Tupelo and realigned as an organization. Funds gradually were appropriated for missing segments, and by the end of the twentieth century, Mississippi’s congressional delegation worked to assure completion of the parkway. The final two sections officially opened on 21 May 2005. The sinewy parkway offers a serene drive through a sequence of indigenous natural backdrops—creek bottoms and prairie, a cedar swamp and loess soil. The route is also studded with cultural sites and artifacts telling the stories of residents from the prehistoric era through the nineteenth century. Mount Locust is the lone restored “stand” of the many lodgings that lined the Old Trace; Emerald Mound is the nation’s second-largest prehistoric ceremonial mound, covering nearly eight acres; and evocative sections of sunken Old Trace are southern highlights. One unadvertised historic resource is found at park headquarters: the Tupelo Homesteads was a twenty-five-dwelling New Deal demonstration project built in 1934. When the project failed, the dwellings became housing for park staff. Toward north end of the Natchez Trace Parkway is the grave of Meriwether Lewis, who died in 1809, and its restored 1848 monument. A span supporting the parkway road over TN 96 became an unintended attraction when it was completed in 1996 as the first US segmentally constructed concrete arch bridge, measuring a lofty 155 feet high and 1,648 feet long. The US Federal Highway Administration designated the parkway an All-American Road in 1996. Natchez Trace Parkway Association Collection, Natchez Trace Parkway Headquarters, Tupelo, Miss.